Digital Transformation (DX) is resulting in big changes in procurement and supplier relationship management (SRM) at every level. Businesses of all sizes are investing in cloud-enabled SRM and eProcurement solutions. The need for intelligent workflows, automation, advanced analytics, and real-time updates coupled with anytime, anywhere access are key factors driving adoption worldwide. 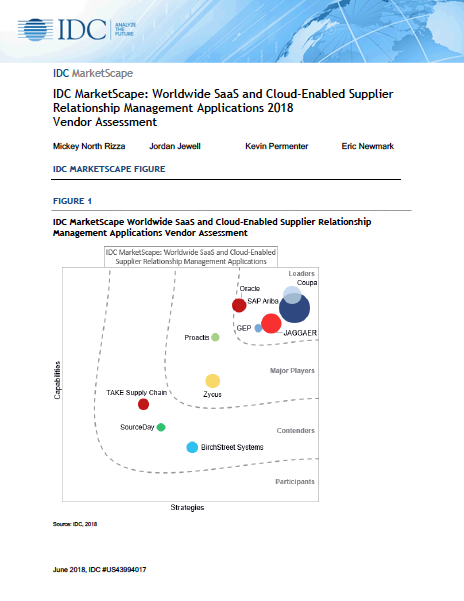 IDC’s latest MarketScape for SRM 2018 report answers many questions technology buyers have when considering a new eProcurement solution. Their rigorous assessment highlights the business benefits of today’s leading vendors.